Talos Energy has provided an additional update on the Zama appraisal program in Block 7, located in the offshore portion of Mexico's prolific Sureste Basin. Talos is the operator of Block 7 in a consortium with its partners Sierra Oil & Gas, a company of DEA Deutsche Erdoel, and Premier Oil. 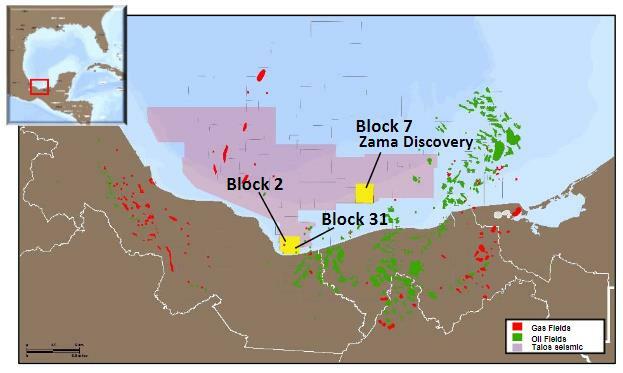 The well logged 873 feet (266 meters) of gross true vertical depth ('TVD') pay, within expectations for the northern extension of the Zama discovery and confirming a consistent net-to-gross ratio range of 68%-73% through multiple penetrations. Talos also captured an unprecedented 714 feet of whole core with 98% recovery, the longest whole core acquired in a single well in the history of offshore Mexico. The well was cased and perforated totaling 248 gross feet of perforated section with varying rock properties. Hydrocarbon flow was established without stimulation in two separate flow tests and achieved a combined rate of 7,900 barrels of oil equivalent per day ('Boe/d'), of which 94% was oil with API gravity ranging from 26-30 degrees, and 6% was gas. The flow rate was restricted with limited pressure drawdown and each zone was shut-in for an extended period to establish a significant radius of investigation for each test, and neither gave any indication of depletion or significant barriers within the reservoir. The operation to sidetrack from the Zama-2 location, drill, core and reach total depth ('TD') of 11,643 feet (3,549 meters) of measured depth ('MD') was completed approx. 9 days ahead of schedule and 16% below budget. The well test operation was completed approximately 5 days ahead of schedule and more than 30% below budget. Operations were safely coordinated and executed with the assistance of several local contractors, including the Mexican-flagged floating storage and production vessel utilized in the flow test.